15 February 2019, from 12:00pm to 1:30pm, join me at the Mall Gallery where I’ll be ‘Art Expert in Residence’ and discuss work in The Pastel Society Annual Exhibition, ideas around art making, get art market insights and ask your questions on all things art! I will be based in the Main Gallery space and you can drop in anytime between 12 noon and 1.30pm. “Art Critic Estelle Lovatt FRSA has the experience of being on both sides of the canvas; having trained as a painter, read art history and as a gallery exhibition curator, Estelle is able to teach, judge and talk about works of art, from Cave Art to Banksy, with expert opinion. What did our ‘Art Expert in Residence’ Estelle Lovatt think of her first Mall Galleries residency day? I was thrilled to be ‘Art Expert in Residence’ at the FBA Futures 2019 Exhibition. I also wasn’t sure what to expect, as total strangers were invited to join me at my table in the Mall Galleries café, to discuss any question about art, from the exhibition itself, through to ideas around art making, and art market insights. As a freelance art critic, who has trained as a fine artist, I have the experience of being on both sides of the canvas, but not both sides of the table. Sitting at my designated table, I wondered whether I would feel like I was speed-dating for an art chat. Or be more like Marina Abramovic at her performance ‘The Artist Is Present’. My table became a place for gallery-goers to rest their feet and eyes, whilst talking ‘art’ with me. I heard lovely comments from people who said how much they liked the exhibition: ‘it’s getting better and better…firing on all cylinders…interesting…impressive’! Several exchanges were very short – a few seconds, but still interesting, some chatted for minutes, others longer. One of the exhibiting artists, Keron Beattie, who had impressed me with his lead and glass figures, came to chat with his friends. We talked with a primary school teacher about what scale is the right scale to make art, as Beattie’s settles at 6 cms. Another visitor dropped by my table for a chinwag, whilst waiting to go to the talk that was taking place alongside the exhibition. He thought the art ‘looked so vibrant’. Me and my newly-made art-talking-table-friends created a ‘community’ in which to engage, schmooze and widen our understanding, appreciation and tolerance of our art world. There were no boring conversations, and it was great to talk about art from the Renaissance to the YBAs – both giving guidance specifically on the individual’s career or work, or more generally the wider subject minus toffee-nosed art-world gobbledygook, often heard, talking about contemporary art and the role of the artist today. Art Critic Estelle Lovatt FRSA talks to Nikki Bedi on BBC Radio London. Round up of the London art scene highlights include Charles I: King & Collector, Royal Academy, in conjunction with BBC 4 TV ‘The Royal Collection’ programme, and book ‘Art, Passion and Power; The Story of the Royal Collection’. The terrific fun Rose Wylie at Serpentine Gallery. Andreas Gursky photographs, at the newly-refurbished just reopened beautiful ‘Brutalist’ Hayward Gallery, Southbank Centre. And The Queen of Pop, Bridget Riley, with her amazing Op art paintings at David Zwirner Mayfair W1. Broadcast: Sun 11 Feb 2018 on BBC Radio London, with Nikki Bedi. Estelle Lovatt and Stephen Pritchard discussing Tate Britain’s decision to bring back labels and rehangs in themes to help audience understand the art. It is the centenary of Duchamp’s The Fountain, the already-made, or “ready-made”, urinal, which launched the 20th century’s controversial obsession with conceptual art. Art critic Estelle Lovatt and art historian Glynn Thompson discuss the story behind the piece and whether or not it should be considered a work of art. A giant golden sculpture of buttocks and more than £20,000 in pennies are among artworks in the running for this year’s Turner Prize. 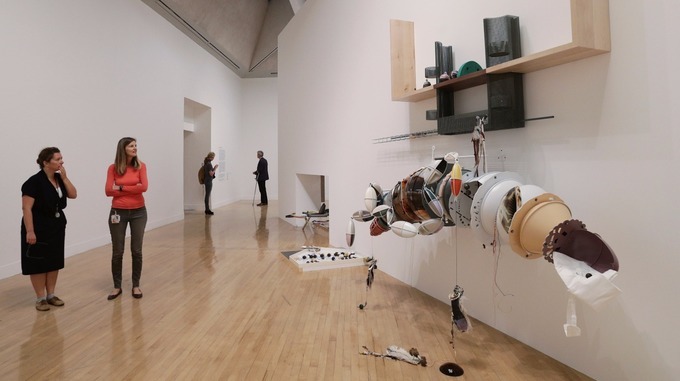 An exhibition of the works by four shortlisted artists will go on display at the Tate Britain on Tuesday. Measuring around 16ft high, Hamilton’s Project For A Door (After Gaetano Pesce) is part of a series of “physical realisations” of images taken from the artist’s archive. 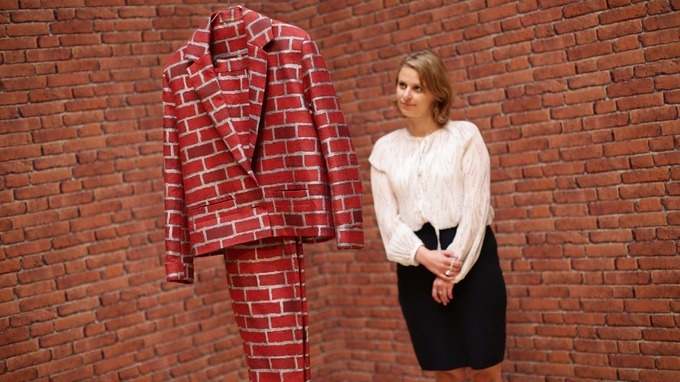 It also consists of a “brick suit” – a fabric suit which camouflages with the wall behind. 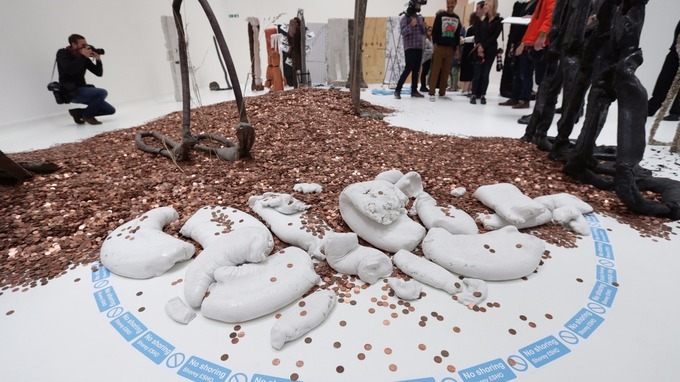 Michael Dean’s work includes a piece consisting of £20,435.99 in pennies, to represent “one penny below the UK poverty line for a family of four”. 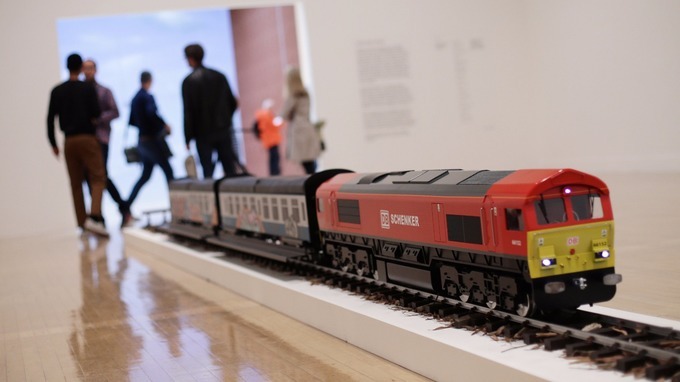 Josephine Pryde’s installation features a train model entitled The New Media Express in a Temporary Siding (Baby Wants To Ride) 2016. Helen Marten’s work features handmade as well as found objects such as cotton buds and fish skins to create “poetic visual puzzles”. The winner of the contemporary art prize, which is now in its 32nd year, will be announced in December.